Tomorrow my family is heading out of town for a five-day excursion down to Portland, Oregon to gather with a few hundred other homeschoolers. This annual trip is a highlight of our year and a chance to reunite with far-flung friends and an opportunity to make new ones. Five days filled with fun for the whole family as well as sharing support with other parents for the process of facilitating our kids's educations. In light of my weekend travel plans, you get a mid-week post! This week the Diva's challenge to "spill it!" encouraged me to explore the intuitive process of art a little more deeply. No set string, no pre-planned tangles or patterns, just the opportunity to invite chaos and chance into my art practice and respond intuitively to what arrives. 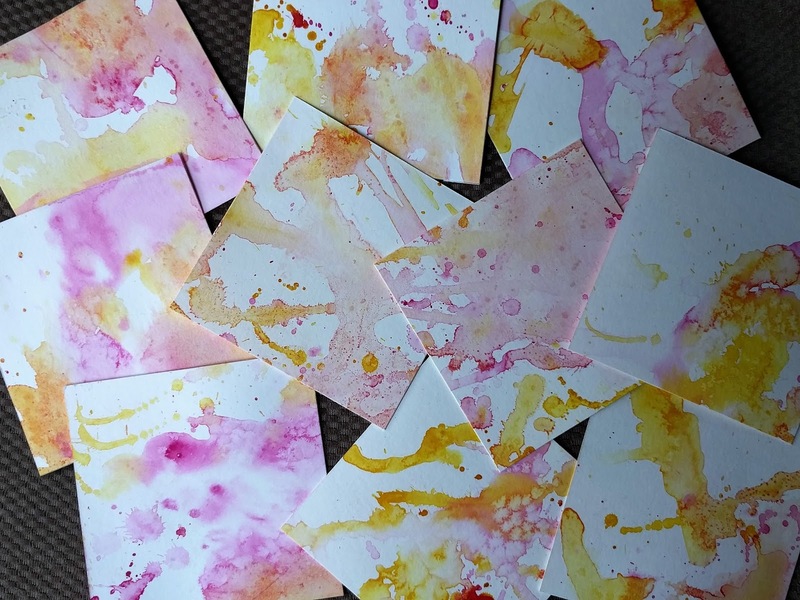 I've been admiring tiles splashed with watercolor lately and so that's what I decided to use for the "spill it" challenge. 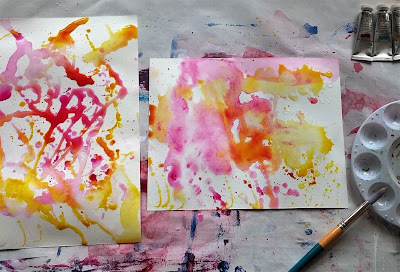 First I splashed some watercolors and then I spilled some salt. 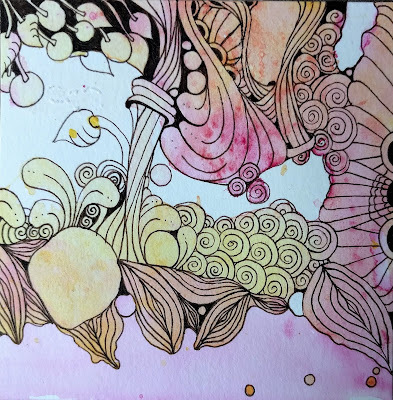 I used the smooth side of one piece of Canson watercolor paper and one piece of Strathmore Printmaking paper because I didn't want too much surface texture of the paper to interfere with the tangling later on with my Pigma Micron pens. 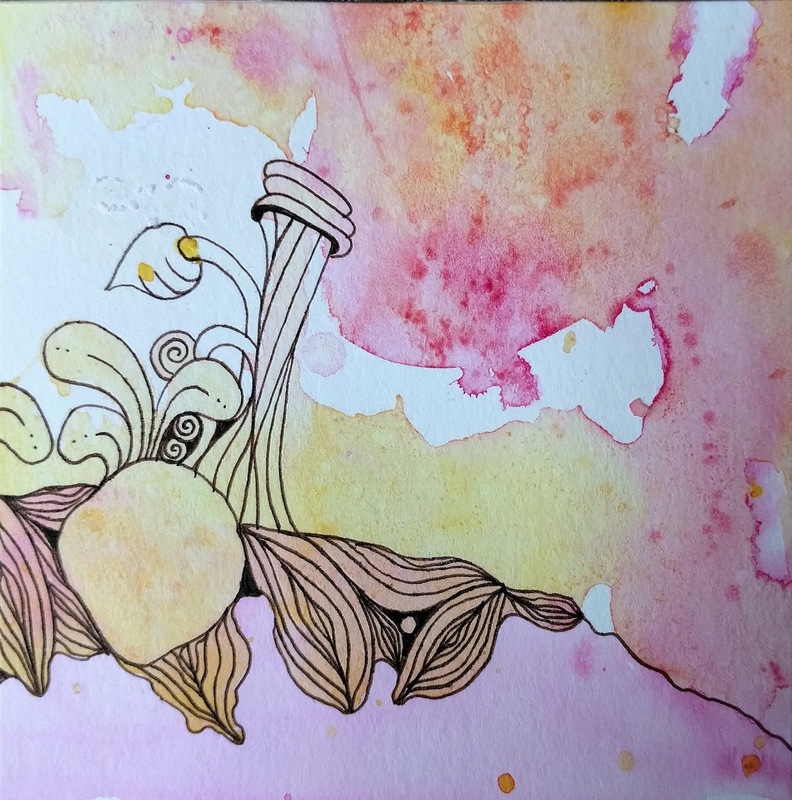 I used Windsor & Newton watercolors in Transparent Yellow and Quinacridone Magenta because I really enjoy the combination of yellows, pinks, and oranges they make together and being transparent colors I knew they would blend beautifully without getting muddy. When everything was dry, I cut both papers into ten 4" by 4" tiles. I chose this tile because the long leggy drip of watercolor across an area of white space immediately brought to mind the tangle Quandu by CZT Eni Oken. That was the start of my intuitive process. I continued to follow the drips, splashes, and spills, filling an irregular shape with Aura-leah, another with Printemps and Flux-like weeds. When a lone Poke Leaf showed up in those Fluxy weeds, I knew that more Poke Leaf and some Poke Root would have to find a home somewhere in the tile. More of each tangle here and there, then joined by Footlites and many orbs and auras. I know that I could keep developing this tile with shading and highlights, but for now it just feels finished. I decided to listen to that feeling. 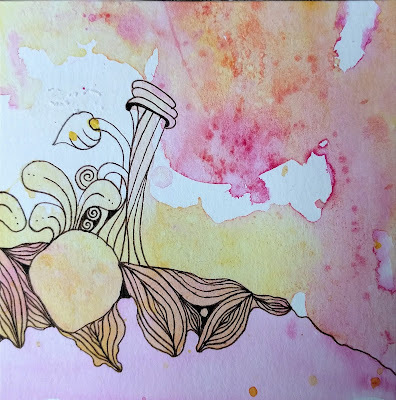 This exploration of the intuitive process and my own upcoming trip to Portland both served to remind me of Portland artist and art educator Flora Bowley and her Brave Intuitive Painting modality. I hope you enjoy this short painting video of hers as much as I do! Wow, this tile is gorgeous!!! Have fun this weekend! Thanks so much, Anne! It was a great trip... now time to recover from all the fun! Thank you for this wonderful video : me too, love to experiment with colors. I like the unexpected results. It is very nice of you, to show us your different steps and how your tile is growing, I like the mix of colors you have chosen , as well as the tangles. I really hope that you and your family are going to have a very special and gorgeos weekend!!! Thank you, Ria, we had a such a great time! 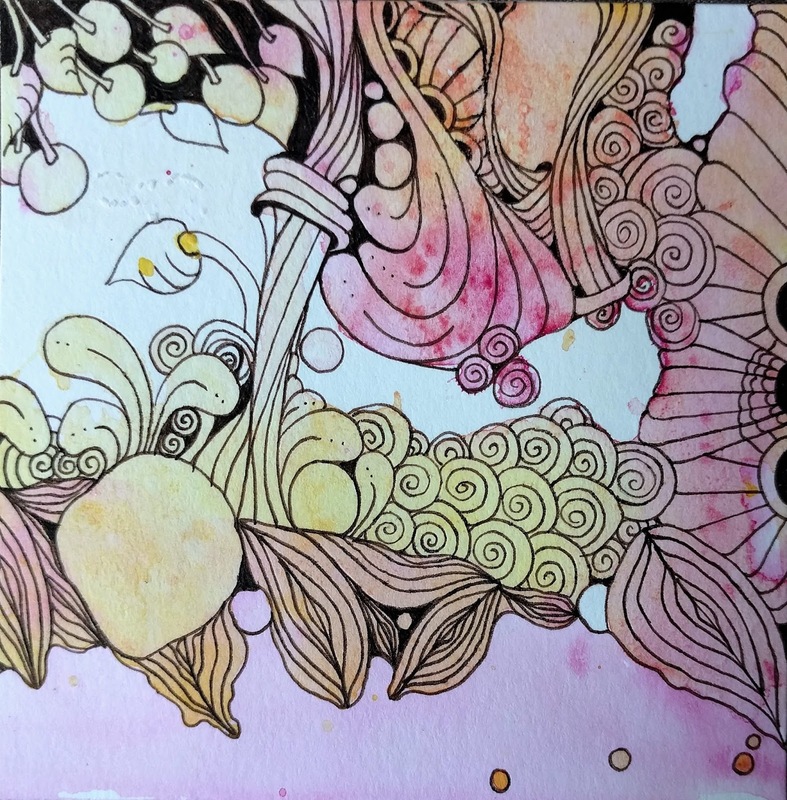 I would love to take a workshop with Flora Bowley some day. I loved reading about your process and the result is lovely. Thank you for your kind comments and for visiting, Suse. I saw a Minecraft cake over on your blog and I have a 10 year old that would love that! Beautiful work! Thank you so much for sharing your process. Thanks so much, Michele. This was a fun one! What a lovely tile! Wonderful colour and combination of tangles. Fun to see how you made your tiles. Very expressive results. I also enjoyed the video. Thanks for sharing! I'm glad you enjoyed this post, Jean. Thanks for you kind comments!